For a very special treat, our guests enjoy taking part in the warmth and comfort of the Elegant Old World tradition of taking afternoon formal high tea. Today we give you our ten favorite places for afternoon tea all located close to 1871 House. Besides world class museums, the Upper East Side has always done traditional afternoon tea spectacularly well. From grand ballrooms and expensive China to whimsical designs, our neighborhood is truly the best when it comes to high tea. For over 100 years, The Palm Court has been New York City’s iconic destination for afternoon tea. In 2013, Chef Geoffrey Zakarian re-launched the Palm Court to include a grand bar, tea by Palais des Thés, and a new and revised menu featuring inspired American fare from morning through evening. Children will be especially delighted with the Eloise-inspired tea (shown above). Starts at $70 per person. Fifth Avenue at Central Park South. Every afternoon The Pierre hotel’s Two E Bar/Lounge hosts a tea service at 3 pm and 5 pm. You have two options from which to choose: the Traditional Tea Service comes with finger sandwiches, scones with Devonshire cream and lemon curd and pastries. The Sweet Tea Service has scones and pastries. The atmosphere tips toward old-world elegance. Starts at $55 per person. 2 E. 61st St.
Arabelle’s renowned afternoon tea is served daily amid the elegant surroundings of Bar Seine. Expertly sourced by Le Palais Des Thés from the world’s best producers, the remarkable teas served at Arabelle match the refined environment to create one of New York City’s best afternoon tea experiences. $55 per person. 37 E. 64th St.
BG Restaurant is located on the seventh floor of luxury New York department store Bergdorf Goodman. With sweeping views of Central Park, BG Restaurant makes for a stunning location to have afternoon tea. Have tea, then shop below – it’s a win-win! $45 per person. 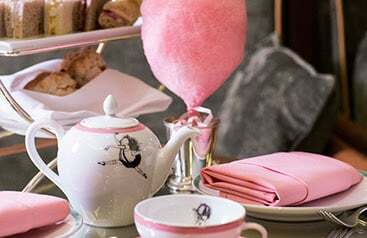 754 Fifth Ave.
A classic choice for afternoon tea inspired by Alice and Wonderland, Alice’s Tea Cup offers the most variety when it comes to tea. Have all the traditional components – sandwiches, scones and dessert – for 1, 2 or 3 persons. For smaller appetites, “The Wee Tea” comes with a pot of tea, scone, any item from the Menu for the Small, and dark chocolate mousse. Starts at $29 per person. 156 E. 64th St. The Gallery serves a complete English tea with exotic teas (including Assam, Lapsang Souchang and Verveine), traditional tea sandwiches, scones with authentic Devonshire cream and fresh pastries. Served from 3 to 5:30 p.m. daily. $52 per person. 35 E. 76th St. This absolutely charming carriage house is an Upper East Side treasure, offering the equivalent of a country getaway with delightful service and exceptional dining. An affordable menu seals the deal. $24.95 per person 251 E. 82nd St.
One of the most well-known patisseries in the world, Ladurée also serves a wonderful Parisian-inspired afternoon tea complete with a selection of their famous macarons, delectable desserts, croissants and sandwiches. 864 Madison Ave. Housed in a classic 19th-century brownstone on an inviting, residential street near Central Park, shopping and museums, 1871 House consists of seven apartment style suites. Uniquely, 1871 House offers both the intimacy of a Bed and Breakfast and the privacy of a traditional hotel. A stay at 1871 feels much like time spent in a personal Manhattan apartment. This entry was posted in Uncategorized and tagged afternoon tea, UES, Upper East Side by admin. Bookmark the permalink.